Companies with efficient production lines benefit from a reduction in total costs and an increase in long term profitability. 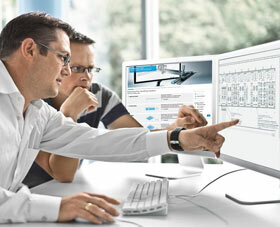 As a worldwide automation supplier, Festo knows that intelligent engineering and energy efficient products provide the foundations on which a company can remain efficient and proftiable. Many successful companies including Festo also ensure that their production line staff have the necessary skills to be able to identify and apply lean manufacturing practices in order to help maximise output, reduce costs and minimise waste. For flexible and reliable production, the required material must be at the right place, at the right time, in the exact sequence. To achieve lean, there is an ideal flow between processes, information and material. In Germany, Festo’s Scharnhausen Technology Plant has developed a state of the art lean factory. We use this experience to support other companies with lean manufacturing principles, tools and techniques. So they can implement lean manufacturing in their own factories to deliver efficiency and production gains. Festo has developed training to help organisations and their managers understand the principles of lean manufacturing – the Synchro Game. Find out more about this fully customisable course. To find out more about developing your people and implementing new technology go to our Resources section.